Flowers in full bloom at the iconic Mughal Gardens of Rashtrapati Bhavan in New Delhi. The Mughal Gardens will open for the public from tomorrow. 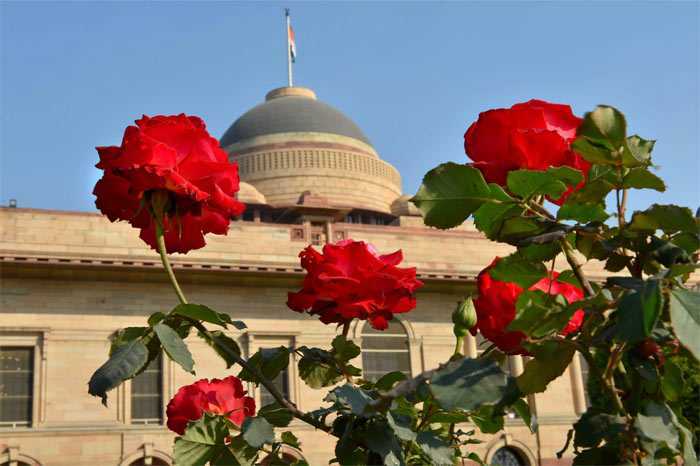 Roses in full bloom at Mughal Gardens of Rashtrapati Bhavan in New Delhi. The Mughal Gardens will showcase 135 different varieties of roses this year. 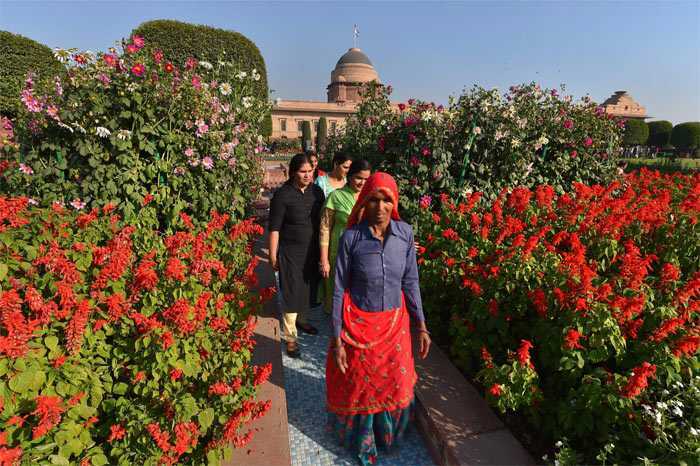 Visitors to the Rashtrapati Bhavan museum take a walk between the beds of flowers at the Mughal Gardens of Rashtrapati Bhavan days before it will formally open to the public. 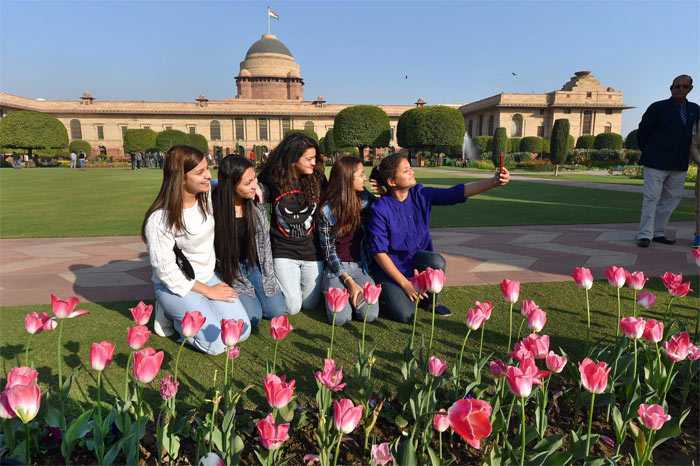 The iconic gardens will open for the public from tomorrow, after President Ram Nath Kovind inaugurates it after the annual gardening festival 'Udyanotsav' today. 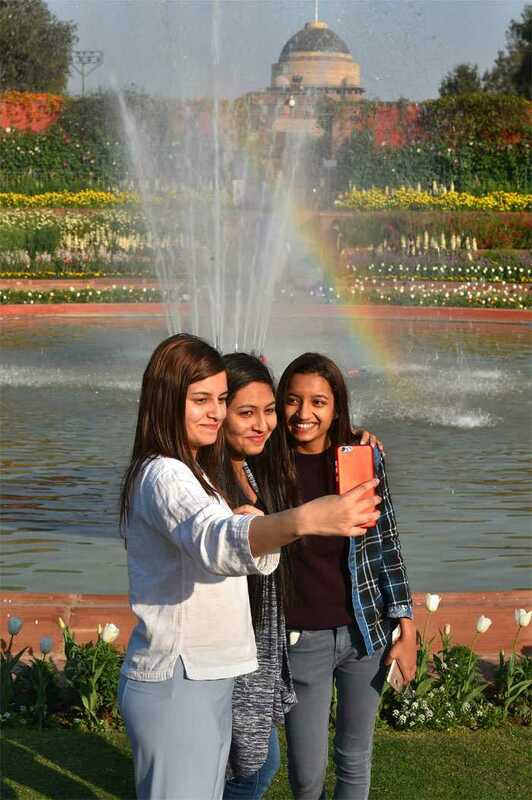 Visitors take a selfie against the backdrop of a rainbow seen near a fountain during the press preview of Mughal Gardens at Rashtrapati Bhavan in New Delhi. 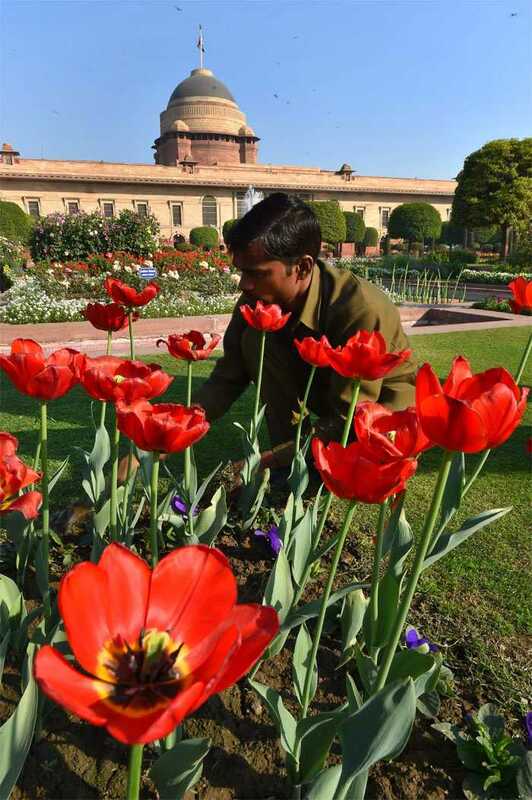 A gardener removes the brown foliage among the tulip beds at Mughal Gardens of Rashtrapati Bhavan in New Delhi. the Mughal Gardens will remain open to the public from February 6 to March 9 between 9:30 am to 4 pm, except Mondays - which has been kept for maintenance and upkeep. 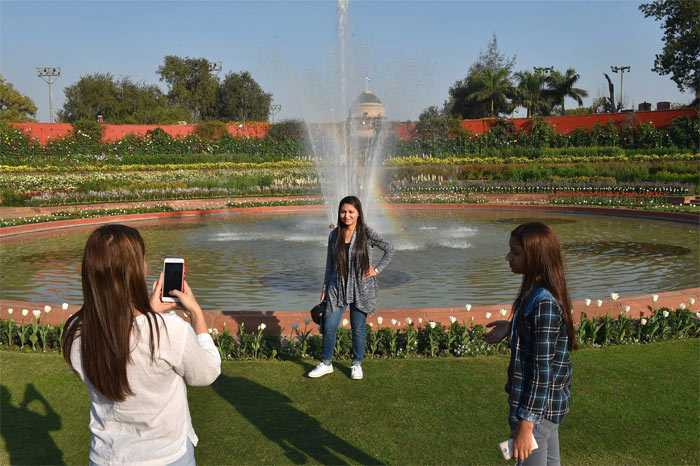 A visitor poses for a picture in front of a fountain during the press preview of Mughal Gardens at Rashtrapati Bhavan in New Delhi on Sunday. 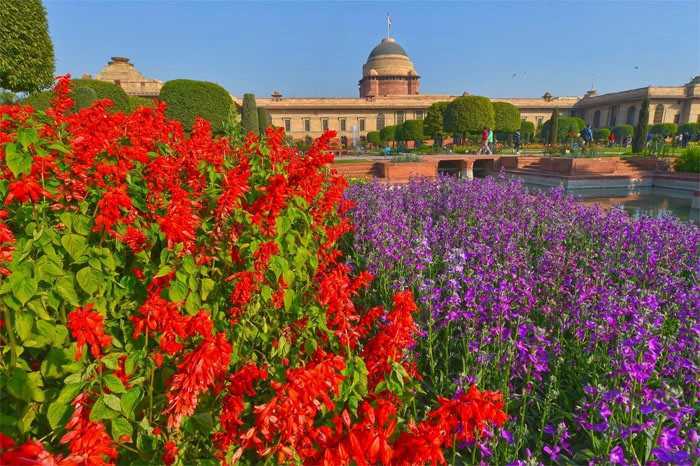 Apart from the Mughal Gardens, visitors this year would also be able to see the other gardens in Rashtrapati Bhavan, which include the Circular, Spiritual, Herbal, Bonsai, Tactile, and Musical gardens. 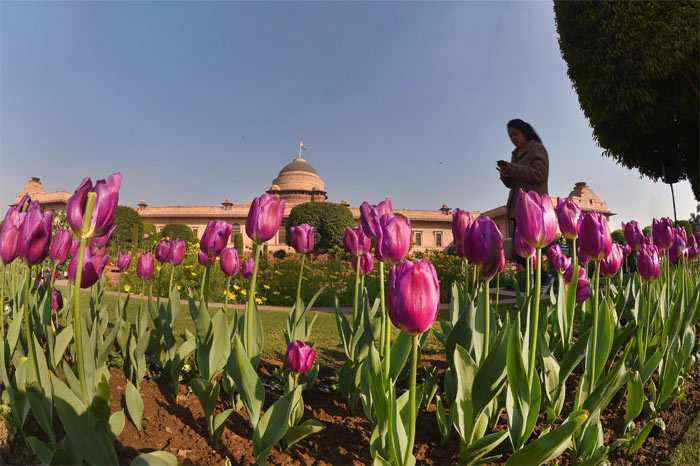 A woman walks along the bed of Tulips at the Mughal Gardens of Rashtrapati Bhavan in New Delhi. Around 10,000 Tulip bulbs in eight varieties of different colours - all imported from the Netherlands - will be the major attraction of the garden this year.